It is a very special moment when you pull on the tartan jumper and step onto the hallowed turf of Chatswood Oval with 14 team mates to pit your resolve, wits and skills to protect and promote the reputation of this very proud club against a visiting team. It is the catalyst for unique character building experiences that stand by you in later life. It produces happy unforgettable memories. Be inspired, stand proud and tall whenever and wherever you have the opportunity to be A Gordon. The name Gordon has many associations and meanings. It strikes a very positive note and sends out a powerful message when linked to the words “Rugby” and “Club”. The following lines of the rousing club song highlight the major factor that propels the Gordon Rugby Club to one of the great strengths. Yes, friendships are the most valuable asset that an individual can acquire. at its gatherings, meetings, matches and functions you are with friends. 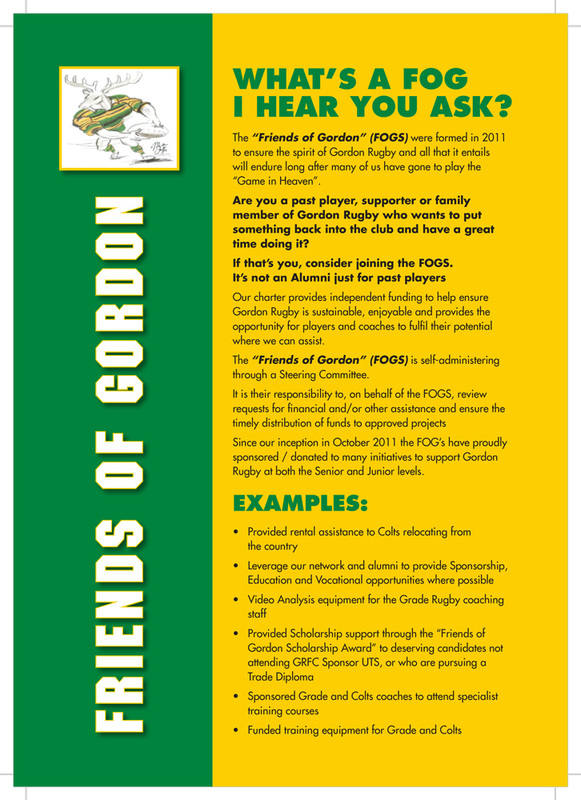 The “Friends of Gordon” (FOGS) were formed to ensure the spirit of Gordon Rugby and all that it entails will endure long after many of us have gone to pay the “game in heaven”. Our aim to work for the benefit of Gordon Rugby at all levels within the community. Our charter provides funding that will assist ensuring that Gordon Rugby is sustainable, enjoyable and provides the opportunity for players and coaches to fulfil their potential where we can. The “Friends of Gordon” (FOGS) Alumni is self administering through a Steering Committee comprising of Peter Sherwood, Peter Bull, Brett Fawcett and Brian Shirvington. It is their responsibility to, on behalf of the FOGS Alumni, to review requests for assistance and ensure the timely distribution of funds and/or assistance to approved projects. All Alumni members are awarded a distinctive FOGS Tie (the tie that goes with every shirt), and we meet at each home game in our distinctive “FOG Marquee” to watch the games and cheer Gordon on, whilst enjoying the company of fellow Alumni and Sponsors in a relaxed and enjoyable, catered environment. A regular in season newsletter is provided to ensure the Alumni is kept up to date with all things Gordon, items of interest or just fun articles. In addition, an annual report is provided to ensure total transparency in all that we do. We encourage past players, supporters, friends and family members who love Gordon rugby and want to put something back into the club, whilst having a great time to consider joining our Alumni. 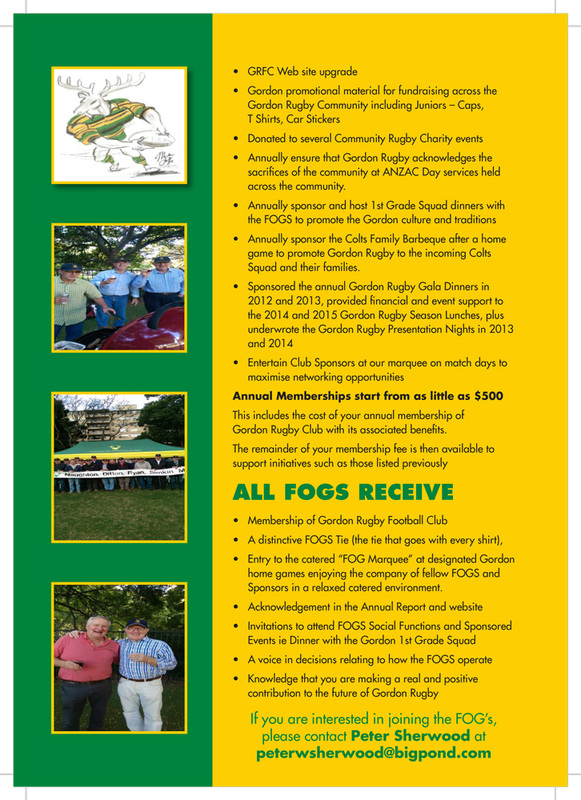 If this appeals to you please refer to the FOGS Membership Form on the website. Sponsorship opportunities are always top of mind so if you have any leads you would like us to pursue, please feel free to let us know, and we will do the rest. The Club wishes to thank the following Friends of Gordon Alumni for their ongoing support.